Finally I am free. Our professor had called me in the morning to tell that tomorrow is the (semi) final submission of the magazine and newspapers. Though after that I didn't start with the work, I had put an alarm of 4:00. As soon as the alarm was on, I snoozed it until it was 5:00, and then ultimately I sat on PC to do some minor changes in them, and went down for printing. I tell you, my house is a chaos currently. Diwali is here, and we all are sick. My mom, my brother, and I...all of us are coughing and have cold. I just came out of fever, and now my mom's temperature is rising. I am so frustrated with us being sick. I haven't shopped a dress for Diwali yet, and that is sooo not good. 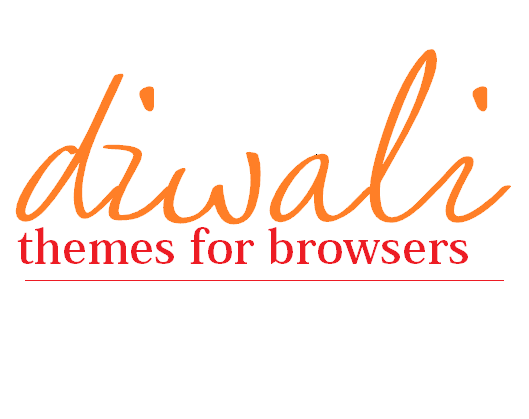 This festive season, along with your houses, sparkle up your browsers as well. I know, even on festivals you have to sit on PC for some work or the other, and there wouldn't be a better way than changing your browser's theme/skin to make you feel good. Plus, if you're living abroad, you can feel at home simply by keeping a Diwali related theme. Sounds great? I added few themes on Mozilla Firefox browser to show you guys. I know the readability is very low. But just for few days, it'd be great if you upload these themes/skins. It just gives an awesome feel while operating your PC during festivals. After all, these are the 'seasonal' themes. They're available not just in Firefox, but in other browsers as well. So go ahead and add a theme. You just have to open the browser, and in settings/options, you will find the option for changing the theme/skin. Are you a theme-changer? How often do you change themes?